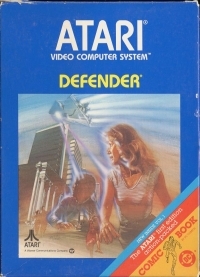 Description: As stated on the box, the game was sold with Atari Force comic book Volume 1. On wave 25, hold a human at the approximate height where your ship first appears and any enemy ships on-screen will turn into the initials BP (for the developer Bob (Robert) Polaro). 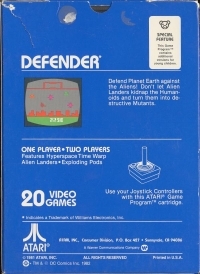 01-08-2018 schtzngrmm Description As stated on the box, the game was sold with Atari Force comic book Volume 1. On wave 25, hold a human at the approximate height where your ship first appears and any enemy ships on-screen will turn into the initials BP (for the developer Bob (Robert) Polaro). 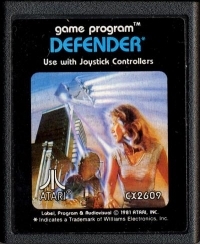 This is a list of VGCollect users who have Defender in their Collection. This is a list of VGCollect users who have Defender in their Sell List. This is a list of VGCollect users who have Defender in their Wish List.